IP finance: Time to put the dog down? -- or ripe for a merciful release? News that HMV was calling in administrators from Deloitte was greeted with sadness by many recorded music lovers from the vinyl era, but with little surprise. The retailer's trading difficulties have been no secret in recent times, and the continued drift of music purchasers from its 250-strong chain to the ever-accessible online music sector was not going to be reversed by tweaking the chain's High Street ethos. According to the Guardian, restructuring company Hilco might be interested in buying the group out of administration, having previously bought HMV Canada from its UK parent in 2011, achieving target-beating Chistmas sales of $65.4m (£40.5m). At this stage there are no other strongly-fancied bidders. Most commentators agree that the HMV brand itself has iconic status. 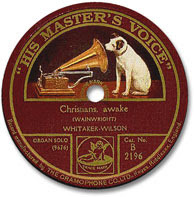 It is indeed iconic, in that it triggers in consumers of "His Master' Voice" products a generally Proustian recall of times gone by: the flagship Oxford Street shop in which customers could sit in sound-proofed cubicles and listen to even an entire side of a long-playing record; the smell of freshly-minted vinyl; the nod to high fidelity reflected in the Nipper logo [it's difficult now, in the digital era where reproduction is uniformly perfect, that the fidelity of a retail record to the master of a original performance could ever have been an issue], the hint of luxury in a time of post-War austerity. However, this blogger doubts that there is a meaningful one-to-one correlation between the power to trigger nostalgia and the ability to persuade a consumer to put hand to wallet and spend cash on a product. Some brands, such as Studebaker or Panhard for cars, had a better chance of cashing in on the power of nostalgia since they not only reflected style but also related to a product that people still use -- motor vehicles. The subsequent revival of Panhard as an international brand for light tactical and military vehicles proves the point. However, HMV's nostalgia attaches largely not only to an older market but also to products which are increasingly seen as part of recorded music's heritage rather than its future. It would take a brave investor to resuscitate Nipper now.